A common, summer annoyance in Tucson swimming pools are these black-winged, yellow Paper Wasps (Polistes sp.). Paper Wasps land on the surface of the water in order to drink and to collect water for use in construction of their papery nests. It's also possible that these colonial wasps use the water to help keep their nests cool. These wasps are covered in water-repelling wax and will not drown even if they are forcibly submerged by an annoyed swimmer. They will just float back up to the surface and fly away. 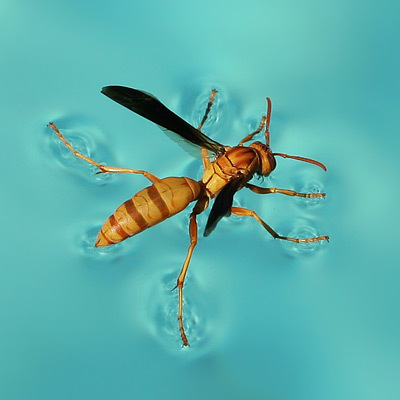 These wasps are able to stand on the surface of the water due to their water-repellant coating, light weight, and the properties of the water's surface tension. As can be seen in the above photograph, these wasps cause the elastic surface of the water to bend but not break under their weight. One way to deal with these wasps is to add a substance to the water that reduces the surface tension. Before landing, wasps test the water by touching it lightly while hovering over it, and if they find insufficient surface tension, most will fly away, while the foolish or reckless ones that do land will usually drown in the treated water.